With the temperatures heating up on a Sunday afternoon, so did the Erie SeaWolves bats as they took the rubber game from the Trenton Thunder in authoritative fashion, 16-5 at UPMC Park. Falling behind 2-0 after the top half of the first, Derek Hill greeted the Yankees No. 3 overall prospect and right-hander, Albert Abreu, with a solo-blast to left-center on the first pitch he saw. 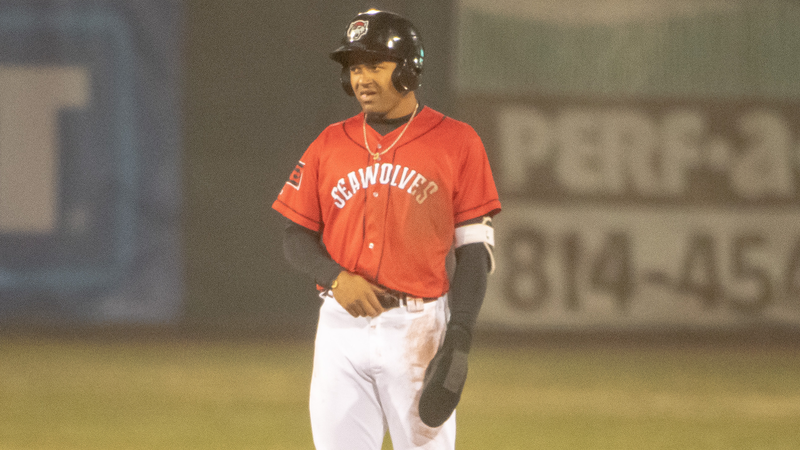 Erie would strike for three more in the second inning after Jose Azocar led off with a triple, one of his three hits (only missing a home run for the cycle). After Chace Numata singled to left to bring home Aozcar, Sergio Alcantara lined one of his four hits back up the middle. With one out, Isaac Paredes walked and Kody Eaves drew a base on balls with the bases loaded. A Daniel Pinero sacrifice fly would give Erie a 4-2 lead after two innings. Far from done, the SeaWolves tacked on one more in the fourth as Alcantara led off with a double and scored on Hill's sacrifice fly. In the top of the third, Trenton's Wendell Rio hit one of his two solo homers to bring the Thunder within two. Knocking Abreu from the game after four frames, Erie did not wait long to tag reliever Jose Mesa Jr. in the fifth. Azocar, Numata and Alcantara all reached to load the bases with no outs and, after a Hill strikeout, Paredes drove in one with an RBI single and Eaves cleared the bases with a double to right-center to make it 9-3. Jhalan Jackson slugged a solo home run in the top of the seventh, but again Erie would have a response. Alcantara and Hill both singled with one out and Paredes roped a double, followed by a Pinero RBI base hit to give Erie a 11-4 lead. The SeaWolves tacked on five more in the eighth as the first five base-runners reached, capped by a Hill bases-clearing double. Hill has now had multiple hits in each of the first three games (8-for-15). The latter two would come in on a Will Maddox RBI single and an error. After claiming its first series of 2019 for a second consecutive season, Erie will now turn its attention towards the Altoona Curve who come to town for a three-game series starting on Monday. The SeaWolves will send RHP Logan Shore (0-0, 0.00) to the mound against RHP Pedro Vasquez (0-0, 0.00). First pitch is set for 6:05 p.m. ET and can be heard on Fox Sports Radio 1330 AM, SeaWolves.com, or seen on MiLB.TV. It is the first Buck Night of the 2019 season presented by Budweiser and Rocket 105. Fans can enjoy Smith's hot dogs, popcorn, 12 oz Pepsi fountain drinks and select domestic draft beers for just $1 each.